Pluripotent stem cells (PSCs) have traditionally been cultured on mouse embryonic fibroblasts (MEFs). These feeder cells contribute to maintenance of pluripotency and depost extracellular matrix components, mediating cell attachment. However, the xenogeneic nature of MEFs and commonly used media components during co-culture conditions are not compliant with current efforts to establish clinically compatible protocols for maintenance and differentiation of PSCs. StemMACS™ iPS-Brew XF is a xeno-free cell culture media formulation for the maintenance and expansion of human PSCs under feeder-free conditions. The formulation supports rapid adaption of feeder-based cell cultures to a feeder-free environment and is compatible with commonly used cell attachment matrices, e.g. Matrigel or Laminin-521. StemMACS iPS-Brew XF enables robust and efficient expansion of human embryonic stem (ES) cells or induced pluripotent stem (iPS) cells over multiple passages while maintaining a pluripotent phenotype as well as pluripotent differentiation potential. 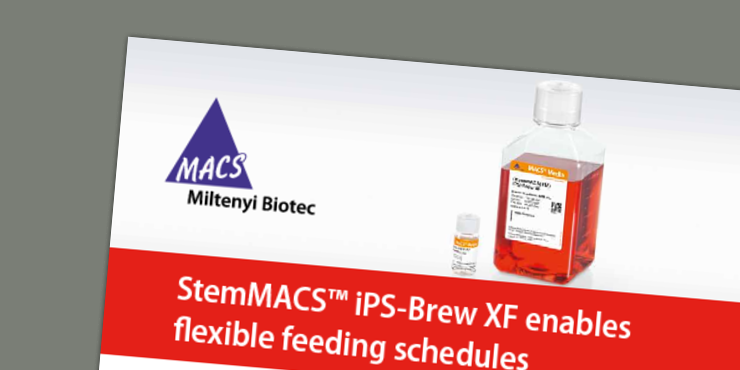 In this application note we show that StemMACS iPS-Bre XF enables more flexible feeding schedules, including the possibility of skipping one or even two feeding days and maintaining hPSC cultures without working on the weekend. Regardless of the feeding schedule used, hPSCs retained the characteristic colony morphology, high expansion rates, and high expression levels of pluripotency markers over five consecutive passages. 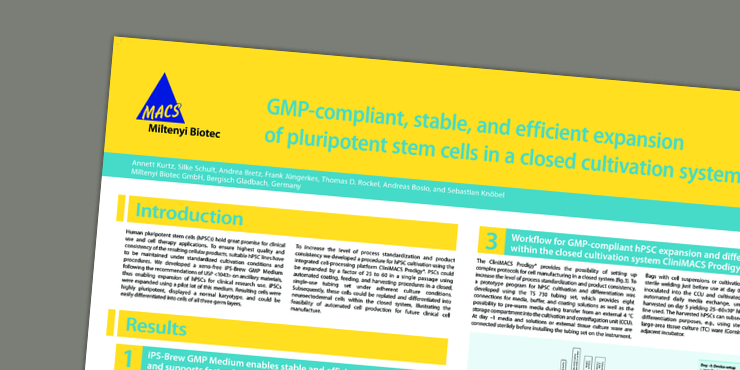 See which method we recommend for passaging of pluripotent stem cells cultured in StemMACS iPS-Brew XF.